The group component controls the volume and pitch properties of all the sounds in its hierarchy. When a group component is placed outside the main Fabric hierarchy and the External Group Component option in the Fabric manager is set it will be automatically registered in the hierarchy. 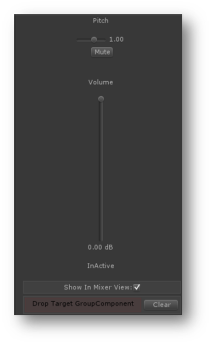 Set volume for all children components. Set pitch for all children components. Mutes all other group components except this one. 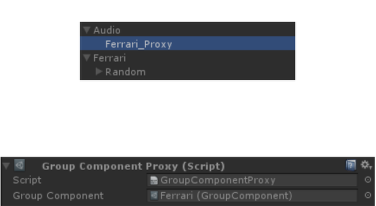 The group0 component in the main Fabric hierarchy that the component will be registered. Only available when the group component is located outside the hierarchy.